Like what you see? Please share this content to your favorite social media platform using one of the share buttons! It’s bracelet creating time! 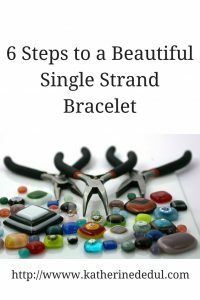 Whether you want to start making jewelry to make a little side income or just want to make it for you or for gift, this will cover the basics. I’m just going to do a simple single strand bracelet today, but what I cover here will create a good base to try more complex projects going forward. Most beaded jewelry pieces start with jewelry wire. I am using just a standard 24 guage wire here. To cover myself, I measure the wire out on my wrist and cut a little bit extra, because while you can always snip the wire down more you cannot add more if it’s too short! 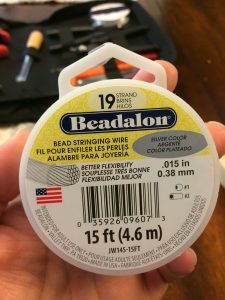 Take a crimp tube, slide it through the wire near one end, taking the tail of the wire and putting it through the bead again so you have a loop on one side of the bead and the rest of your wire underneath. You’ll take your crimper (see my tool rundown here) and crimp that tube. You now have a loop and can start to string your beads for your bracelet underneath that crimped bead. You’ll have a tail, but that’s okay, I’ll show you how to hide it. If you like, you can use a piece of tape to secure the wire loop to your work surface. Now you’ll want to start stringing your beads along. You can keep it simple with one type of bead throughout or feel free to add a pattern. I like to add accent beads. I usually go with metal accent beads together with a colored bead and pick a repeated pattern (such as one accent, four beads). It is jewelry maker’s choice here, do what YOU want to do here. 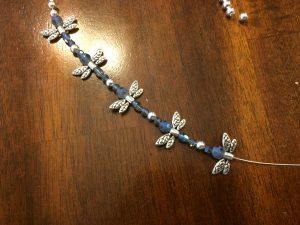 You’ll take the tail you created in the previous step and make sure it’s slid into the first few beads you do, effectively hiding it from view. 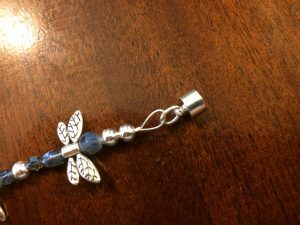 If it still sticks out a bit, you can snip it down so it is hidden underneath your beads. 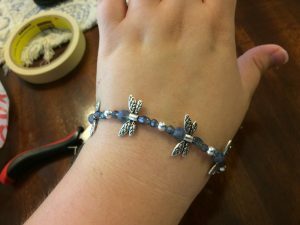 By this time, you have the bracelet at the length you want, I usually use my own wrist and measure it up to make sure it’s not too snug or too loose. When you’re ready, you simply want to grab another crimp tube and make another loop with the remaining wire. You want to flush the crimp tube up with your project (so the beads are relatively snug) before crimping. Once the tube is crimped, you can work the tail of the wire through your project (this is why you don’t want your bracelet too tight, you want just a little bit of give) so they are now hidden. 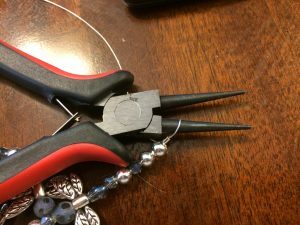 I like to use my round nose pliers to help size the wire loop up as it helps get the snug fit you’re looking for. Now it’s time to go ahead and get a clasp onto your bracelet so you can actually start wearing it! I chose to do a magnetic closure clasp, but you can use a spring ring or lobster claw (maker’s choice!). If you’re using a toggle though, you’ll want to have that on a project with heavier beads as they’ll keep the toggle from opening during wear. To attach the magnetic closures to my work, I attach it using the ring beneath the clasp. 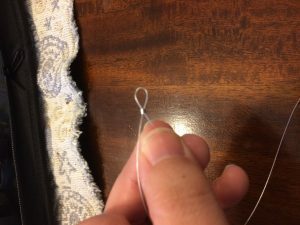 I open up the ring with a pair of pliers and slide it onto the loop and the little loop on the bottom of the closure, closing the split ring up once attached. I’m choosing to use the loop as my closure, but you can also attach another split ring on the other side. Your bracelet’s now ready to wear, good work and congratulations! This project covers the basics, you can move on and experiment with other pieces. Happy creating! If you want to receive more crafty ideas, delivered straight to your inbox, enter your email down below. As a thank you, I will give you the very worksheet that I use when I need to complete a new craft for here on the blog!